Westin, R., Holmgren, N., Hultgren, J., Ortman, K., Linder, K., Algers, B. In press. Post-mortem findings and piglet mortality in relation to strategic use of straw at farrowing. Prev. Vet. Med. • Post-mortem examination was performed in 798 piglets from 363 litters. • The major post-mortem findings were starvation (34%) and crushing (28%). • Fewer piglets starved to death in STRAW compared to CONTROL-litters. 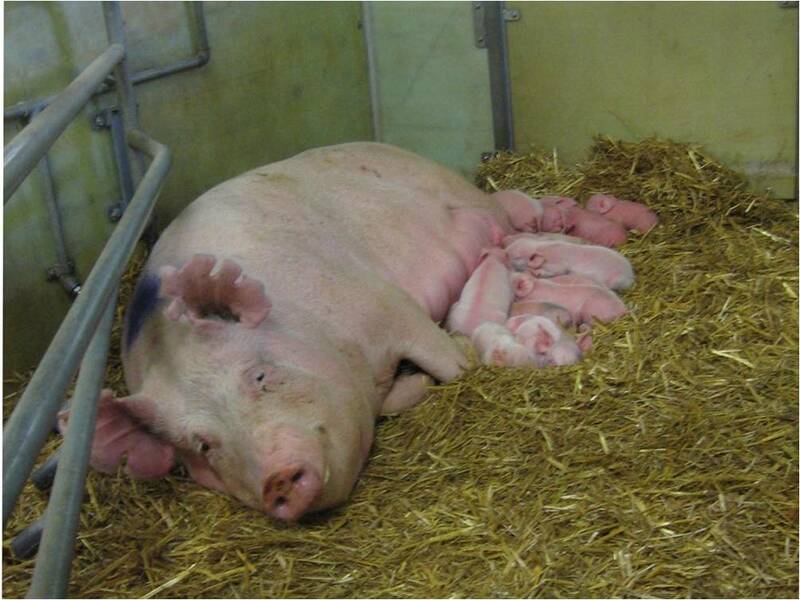 • Strategic use of straw reduced the number of stillborn piglets by 27%. their environment. 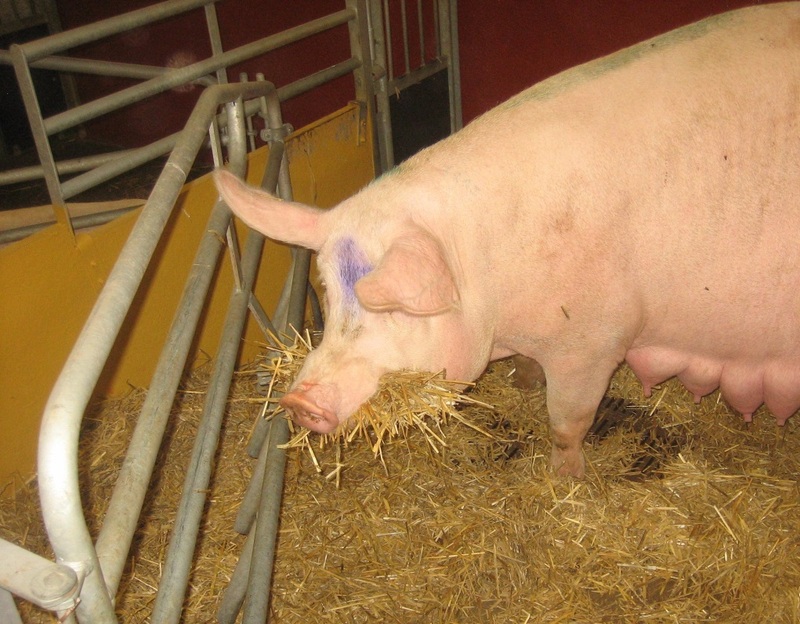 In order to facilitate nest-building and to provide a suitable environment for the newborn piglets, a strategic method to supply loose housed sows with large quantities of straw at farrowing has been developed by Swedish piglet-producing farmers. The objectives of this cohort study were to use post-mortem findings to assess the causes of death and to quantify the effect of a large quantity of straw provided before farrowing compared to limited small daily amounts on stillbirths, post-mortem findings in piglets dying within 5 days after birth and the pre-weaning mortality. On each of four commercial piglet-producing farms in South-West Sweden, one batch of sows was studied during two consecutive lactations. At inclusion, sows were randomly assigned to two treatment groups, and sows remaining in the batch during the next lactation switched treatment group. In the STRAW group (n = 181 litters) sows were provided with 15–20 kg of chopped straw 2 days prior to the calculated date of farrowing. Sows in the CONTROL group (n = 182 litters) received 0.5–1 kg of chopped straw on a daily basis plus about 2 kg for nest-building when the stockperson judged the sow to be about to farrow. 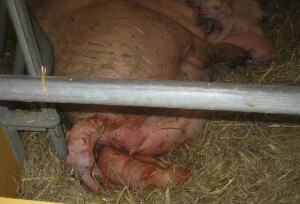 After onset of farrowing, additionally 1–2 kg was given. 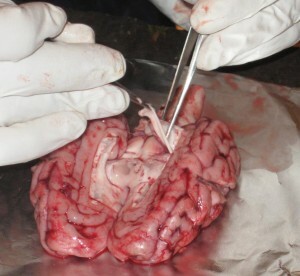 Post-mortem examination was performed in all piglets that died within 5 days after birth (n = 798). The three major post-mortem findings were starvation (34%) crushing by the sow (28%), and enteritis (24%). In conclusion, strategic use of large quantities of straw reduced the number of stillborn piglets per litter by 27% (p = 0.007). Under the conditions studied, the pre-weaning mortality of liveborn piglets was not affected by treatment; however, the distribution of post-mortem findings differed with fewer piglets dying due to starvation and more due to crushing and enteritis in STRAW litters. Westin, R., Hultgren, J. Algers, B. In press. Strategic use of straw increases nest building in loose housedfarrowing sows. Appl. Anim. Behav. Sci. • Nest building behaviour and farrowing duration were studied in 138 sows. • A large quantity (15–20 kg) of straw given once was compared to small daily amounts. • Time spent nest building during 18 h pre-partum was increased by 19%. • A 1-h increase in time spent nest building reduced the farrowing duration by 12%. 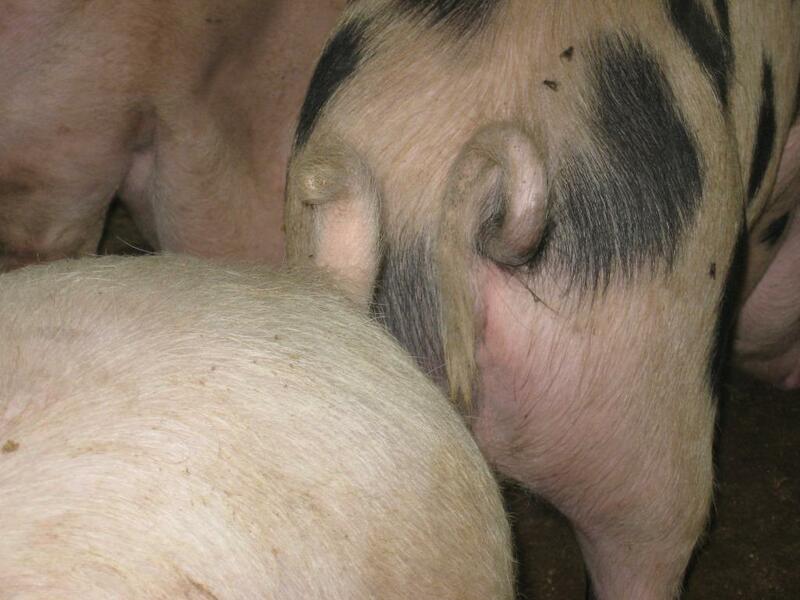 In spite of domestication, sows are still genetically programmed to perform nestingbehaviour close to farrowing. In order to facilitate nest building, a method for a strategic useof large quantities of straw has been developed by Swedish piglet producing farmers. Theobjectives of the present study were to quantify the effect of strategic use of 15–20 kgof chopped straw given once 2 days prior to expected date of farrowing, compared tosmall daily amounts (0.5–1 kg) and 2 kg close to farrowing (controls), on the nest buildingbehaviour and the duration of farrowing. The behaviour from 18 h pre-partum until 1 h afterbirth of first piglet and the duration of farrowing was continuously observed in 138 videorecordings from 4 commercial farms. On each farm, 20–34 sows (parity ≥ 2) were stud-ied during one or two consecutive lactations. Compared to controls, strategic use of strawtriggered the sows to start nest building earlier and increased the total time spent nestbuilding pre-partum by 19% (p = 0.039). Sows given large amounts of straw also performedless nesting behaviours during the first hour after birth of the first piglet. This shows thatnest building is affected not only by the presence of straw, but also by the quantity of strawprovided, and that 2 kg of chopped straw seems to be too little to make the sow terminatenest building well in advance of farrowing. There was no significant effect of treatment onthe duration of farrowing but a strong negative association was found between time spentnest building pre-partum and the duration of farrowing regardless of treatment. The modelpredicted a 1-h increase in total nest building time pre-partum to be associated with a 12%(95% CI = 4–19%) shorter duration of farrowing (p = 0.004).